Okay. I outed myself a few weeks back as a closet New Monkess fan so let's just take this the whole nine yards. Shall we? I admit it. When I was a kid, I loved boy bands. Not in an "oh they're so dreamy" type way but in a "man, these guys are cool" kind of way. All the girls at my school loved these guys so I'd be crazy not to show some sort of an interest in them, right? Of course, there were the New Kids on the Block who I listened to despite being made fun of by my brother. I had their videos, their tapes, and even a respectable stack of New Kids trading cards. 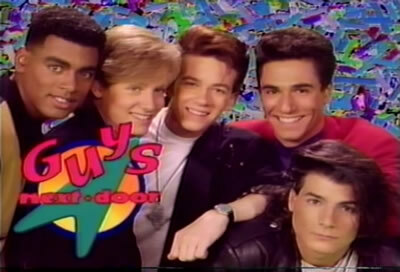 Riding the coat tails of the New Kids were a group of five guys put together for an NBC Saturday morning show called the Guys Next Door. They sang, they danced, and they did goofy sketch comedy -- and I loved it. The Guys Next Door featured Chris Wolf, Eddie Garcia, Damon Sharpe, Patrick Dancy, and Bobby Leslie. You may recognize a few of these guys -- Patrick was Brian on the date auction episode of Saved By the Bell and Eddie was Johnny Dakota from SBTB's "no hope with dope" episode. And while you may not know his name, Damon Sharpe has gone on to an award-winning career as a music producer and songwriter. Last week, I couldn't help myself. I was digging through some old tapes and got the bug. It was time to upgrade my 22+ year old Guys Next Door cassette to a CD copy. It's times like this that make me say, "Internet, I love you." A quick buy on eBay, a few days wait, and my Guys Next Door CD had arrived. Rather than give my review of the album and the show two decades late, let me just tell you about two things related to the Guys. 1. If you're looking for Guys Next Door stuff online, be careful. When you search for "guys next door" your results will include a lot of videos featuring buff naked dudes. 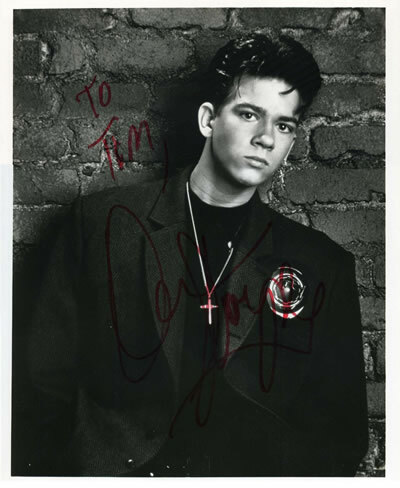 Yes, ladies and gentlemen...I actually wrote a letter to Damon Sharpe in the Fall of 1990 to tell him how much I liked the Guys Next Door. Because that's what guys who have just started high school do, right? 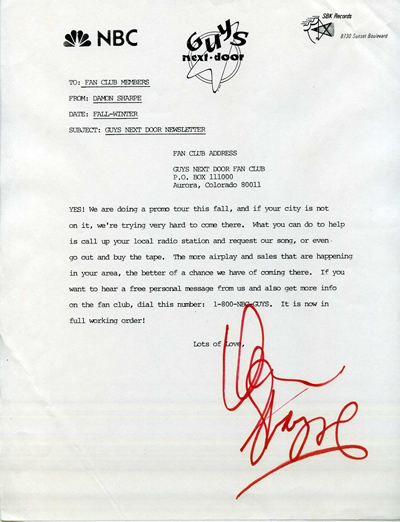 Still, both the picture and the letter appear to be legitimately signed...by someone. The letter suggests calling 1-800-NBC-GUYS for a "free personal message" from the Guys Next Door so I decided that I'd give them a call...22 years later. Remember those buff naked dudes I mentioned? I think they have a phone line, too. Oh. My. God. I vaguely remember these guys but I just want to tell you you're very brave. I somehow managed to completely bypass the crazy, obsessive NKOTB phase that most of my female peers went through (I know crazy, right?). I did, however, once have a thing for Color Me Badd...who are so f'n badd they need two d's to convey it. I think I'm gonna start using the phrase "bust your attitude" in daily conversation (this was the name of my favorite song of theirs). I'm not quite sure what "bust your attitude" means but I'm going to start saying it. 1) What does it mean that the phone number is now in "full working order?" Was there a time when it was only in "somewhat" working order? Did the people who called it during the "somewhat working" phase have a bad experience and if so is one of the reasons why these guys didn't make it? 2) "..or EVEN go out and buy the tape." Like it's outlandish to suggest such a thing. 3) My first impulse after reading this article was to immediately check and see if Spotify had their music, but sadly not. You heard it here first: The Guys Next Door are too cool for Spotify. But they're not too cool for YouTube! funny post. I don't remember this at all. My confession is that I liked The Party. Anyone? They were a pop group spinoff from the Mickey Mouse Club in 1990. I was ten at the time and wanted to get into some slightly edgier stuff past cartoons and toys. Their albums did cover some great rock and roll material like The Ronettes and Elvis Costello, so it ain't all that embarrassing. I'm inspired now. Maybe I'll do a post about 'em. You just wait until I break out my New Kids stuff. I actually got a phone call from Chris Wolf after their show went off the air, and my mom wrote a guilt letter to them about how I had saved my allowance for months to join their fan club and buy their cassette tape. Ahh, memories. I was in love. Ohhh... Lol! Of course I remember The Guys Next Door. It was fall of 1990 when they started, I can say. What beautiful time I spent watching this hillarius show!!! At that time I had a girl who became to be my wife, Lourdes. I defenitely loved that TV show and their songs and everything. I still love them. I married that chick at February 13th 1991 and the show finished at 16th at very same month. Lourdes used to stay in my home the whole day long and I used to take her home at night, when I came back home (at midnight), we watched the show with my friend Benjamin and my sisters. Actually, my wife never watched it, but I still remember that time of my life like it was yesterday.